This Thunderbolt 3 to PCIe M.2 adapter lets you take advantage of the speed of PCIe solid-state drives, connected externally to your Thunderbolt 3 desktop or laptop computer. 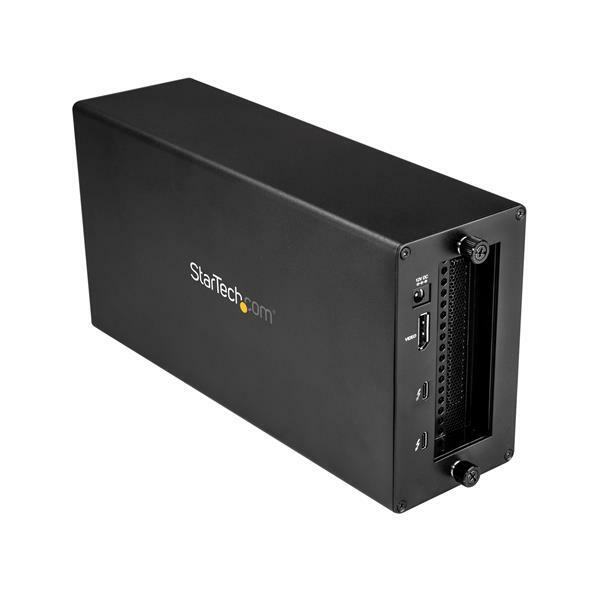 The adapter combines the StarTech.com Thunderbolt 3 PCIe Expansion Chassis (TB31PCIEX16) and the M.2 PCIe SSD adapter card ( PEX4M2E1), giving you a DisplayPort output and an additional Thunderbolt 3 port. 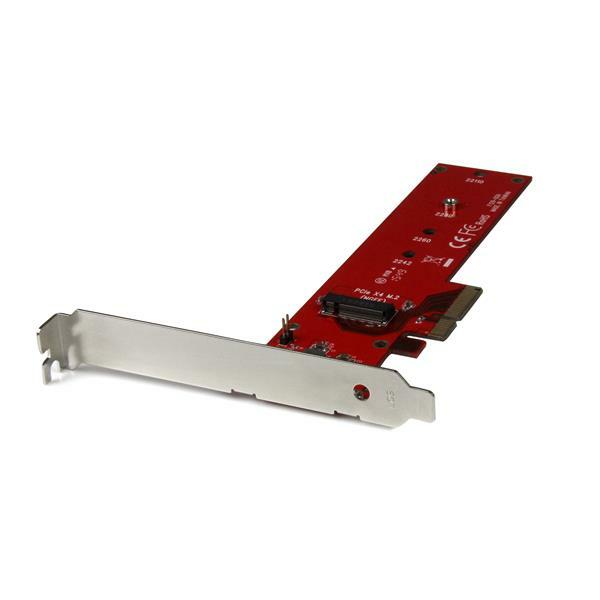 Get ultra-fast data access by adding this PCIe M.2 SSD adapter externally to your existing Thunderbolt 3 computer, using the Thunderbolt 3 chassis -- improving your storage performance and expanding overall capacity. 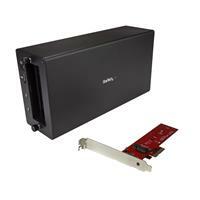 The adapter supports PCIe M.2 SSDs (NVMe and AHCI): 2242, 2260, 2280, and 22110 drives. Connect additional displays through the chassis’ dedicated DisplayPort output and second Thunderbolt 3 (USB-C) port (USB-C video adapter may be required). With two extended displays, you can multitask effortlessly, avoiding the hassle of repositioning open windows or programs repeatedly throughout your workday. The PEX4M2E1 and TB31PCIEX16 are backed by a StarTech.com 2-year warranty. Note The expansion chassis does not support video cards. 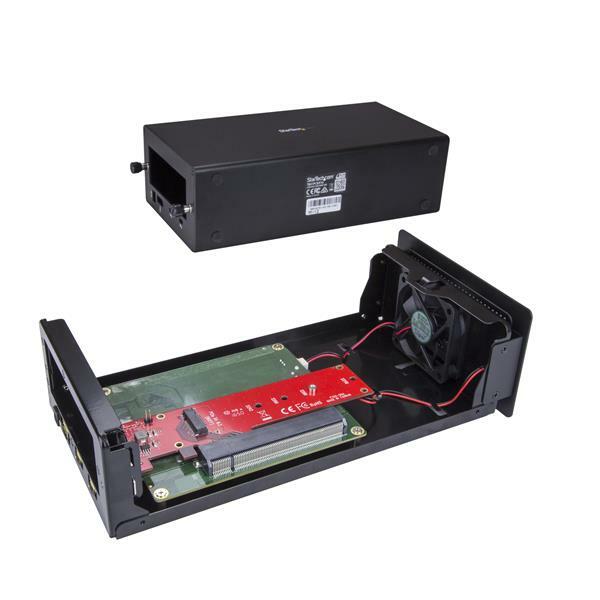 This expansion chassis does not provide full power delivery but will provide 15W of power, resulting in a slow charge to some laptops, such as MacBook Pro. When the dock is connected to your host laptop, a charging icon may appear on your laptop's screen. This is only sufficient enough to charge your laptop in sleep state, and charging will require an extended time period. 5K support can only be achieved using a Thunderbolt 3 5K monitor. DisplayPort 5K monitors will not work with this expansion chassis. 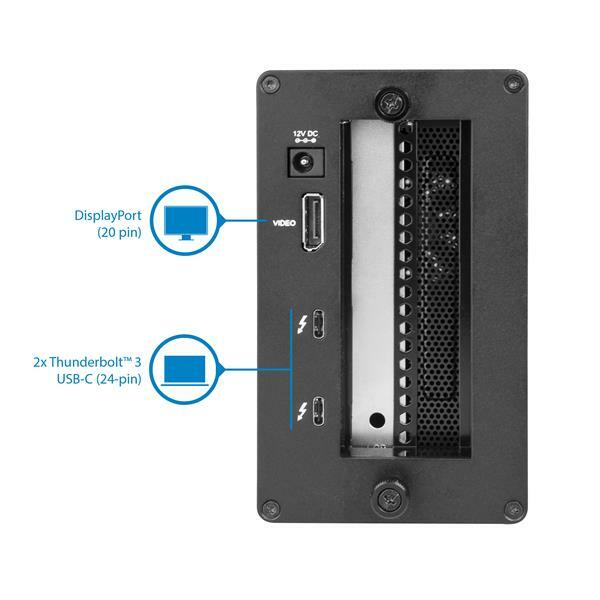 Secondary Thunderbolt 3 port can also be used to connect USB 3.1 (10Gbps) USB-Type C devices, such as USB 3.1 Hubs. Backwards compatible with USB 3.0 (USB 3.1 Gen 1), and USB 2.0.